Hearing loss can occur at any age. Left untreated, it can affect a person’s physical, emotional, and even mental health. At Associated Hearing Professionals, we care about each patient’s whole well-being. That’s why we take a comprehensive approach to diagnosis and treatment. 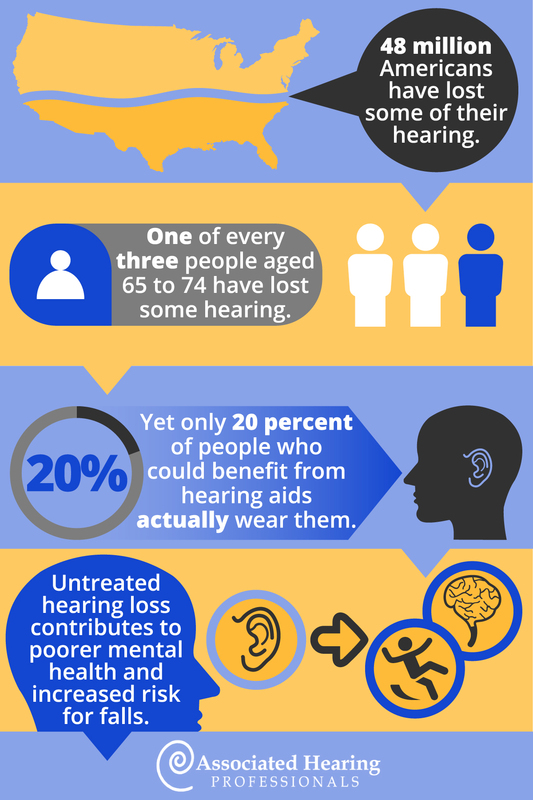 Research shows that untreated hearing loss can lead to significant challenges in virtually every area of a person’s life. The loss can have a tremendous social impact as communication becomes strained. When it is difficult to understand what someone is saying, it can become too easy to give up on conversations. Someone struggling to hear and understand may start to avoid social situations, leading to increased withdrawal from even the closest family, friends, and co-workers. Psychological effects may develop. Hearing loss can make a person feel irritable, nervous, or anxious. In some cases, depression can set in, resulting from increasing frustration with compromised hearing in daily life and isolation from communities. Self-esteem can decrease, especially if tasks and activities once done well are now challenging because of the hearing loss. What about physical issues? You may be surprised It may be surprising to learn that studies show a link between untreated hearing loss and physical conditions. In fact, these conditions often co-exist with hearing loss: diabetes, heart disease, Alzheimer’s disease, and chronic kidney disease. In addition, those with untreated hearing loss also have a higher incidence of falling and hospitalizations. Those with untreated hearing loss, do not need to suffer in silence. With treatment, you can live a fuller, more vibrant life. Treatment can lead to improvements in social, psychological, and physical well-being, as well as increases to your overall quality of life. Improving hearing could improve your health and happiness! Hearing help begins with a comprehensive exam to determine the extent and type of hearing loss. Results and recommendations will be fully explained, and if appropriate, a hearing aid evaluation will be performed, along with a demonstration, fitting, and programming. New hearing aids are custom-fitted for your hearing loss, needs, and comfort. Complete counseling, explaining what to expect and proper maintenance is always included. If other treatment is needed to address ringing, hissing, or roaring in one or both ears, appropriate measures will be taken. At Associated Hearing Professionals, we are passionate about improving our patients’ quality of life through better hearing. We take the time to understand each patient’s needs, and we work with the patient and family to achieve hearing health goals. Our experience extends beyond hearing loss into other areas of auditory health, including tinnitus treatment and hearing conservation evaluations. We carry some of the most popular hearing aid brands including Lyric, Oticon, Phonak, Resound, Siemens/Signia, Starkey, Unitron, and Widex. So often patients will say they cannot believe they waited so long to do something about their hearing. Make an appointment today to treat hearing loss and take steps to better, more vibrant health. For your convenience, we offer Care Credit and 0% interest payment methods for qualified individuals. Give us a call today. *Disclaimer: Testimonials reflect an individual patient’s experience and may not depict the expected results for others.